Unicorn Riot attended the opening of the “Iŋyaŋ Wakȟáŋaǧapi Othí” (Sacred Rock Camp), a Spirit Camp, on the Standing Rock Nation, to bring attention to the proposed route of the Dakota Access Pipeline [DAPL].” A caravan of over 200 supporters, led by forty riders on horse, left Fort Yates for a thirty mile trek to the camp located just north of Cannonball. The camp was erected to oppose the Dakota Access Pipeline. 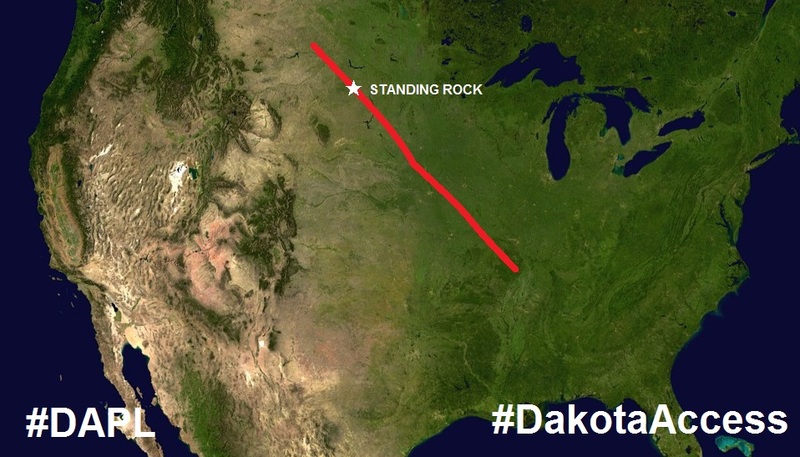 If built, the pipeline would bring about 450,000 barrels of fracked Bakken crude oil under the Missouri River. Tribal citizens and supporters said the pipeline threatens the Missouri, where their communities get their drinking water. They said that if the pipeline spilled, their water would be contaminated, and future generations would be unable to live off the land. The river also nourishes the wildlife and sacred medicinal plants which they hunt and gather. They also stated worry at North Dakota’s safety record; the state never notified residents about more than 300 spills which occurred over a two year period. “I am not expendable, my grand children are not expendable. We have to fight to live,” Ladonna BraveBull Allard. The tribal citizens felt that the tribes weren’t properly consulted, and the building of the pipeline violates treaties made with the United States. The encampment plans to stay until the pipeline is stopped. More info on the blockade.